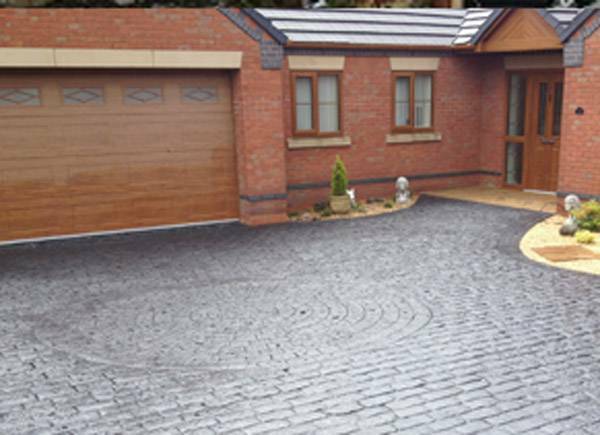 Driveways in Codsall from Cobblecrete are the ideal way to wow visitors and create a long lasting first impression. We can design patterned concrete driveways to compliment your garden or you may want your driveway to match the style of your house. Our Slate pattern in brick red colour and charcoal antique offers a diverse mix of colours and helps individual areas stand out. Another Slate design that offers something unique is the European fan pattern in dove grey with slate grey antique, which will give your driveway a quirky and innovative quality. You don’t have to settle for just one type of pattern for your driveway, as when using slate, concrete or stone we can design multiple patterns to fit your style. Every driveway is different, and you may want to have rounded patterns around doors and garden areas and standard patterns for the rest of the space. Cobblecrete have been providing high quality designs of driveways in Codsall, Wolverhampton, Tettenhall, Wightwick, Wombourne and Bridgnorth for over 25 years. To get the ball rolling, we offer a free measuring and home assessment where we can recommend the types of materials and patterns that will suit your driveway. We don’t just service the domestic market either, we regularly work with a range of businesses and commercial projects. Get in touch with us today to speak to one of our friendly team.